Although the 4Runner is a fine vehicle it is lacking in a few areas. One of which is instrumentation. To make up for this I decided to install some additional gauges. This is even more important when bolting on a supercharger, which pushes the engine and the rest of the drive train well beyond what it was originally designed for. Why you ask? I'm nuts... I also just wanted to know how all the systems hold up with my bolt on aftermarket supercharger. The information gathered from these gauges has proven very valuable and uncovered some serious problems that I have corrected with other upgrades. The boost gauge has proven to be the least important of them all. With the supercharger, manifold pressure is completely dependant on throttle position. There is no lag in boost like with a turbo, so if you have the throttle full open then you have full boost. It is just that simple, so you really don�t need a gauge, but it is kind of cool to have anyway. The exhaust gas temperature (EGT) gauge shows how hot the exhaust gas is. The way the supercharger over runs the stock fuel system these temps get super hot which I am convinced will shorten engine life. If you have a supercharger I highly recommend installing an EGT gauge so you can monitor the exhaust temp. You can check out my fuel delivery page to see why I think this is so important. 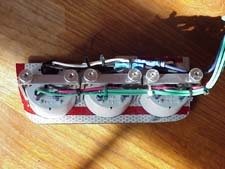 I used a Westach dual EGT gauge that has two needles in one gauge so I could monitor the EGT in each cylinder bank. They are high quality and so much cheaper then Auto Meter. It is important how to read an EGT gauge. If you see the temps going up as load increases and then suddenly see the temps drop off, be careful. That is a sign of detonation and a tremendous amount of heat is being absorbed internally and could lead to an engine failure. Look out for that. In my dyno testing max power was between 1400-1450 F. Over 1450 the power would drop off indicating a loss of power from to lean of a mixture. I was curious to know what the compressor discharge temp (CDT) was of the compressed air leaving the supercharger. I flat ran out of holes to mount gauges so I had Westach make a custom gauge that combined EGT and CDT functions into one gauge and mounted it in a double pillar pod with the boost gauge. This satisfied my curiosity on the CDT temps. A CDT gauge is really not to important because you can't really do much about the CDT with the TRD Supercharger unless you want to install a water injection system. The fuel pressure gauge has been very useful. As soon as I installed it I discovered a serious problem with my fuel pressure. It was 80 PSI at idle which would drop to 50 PSI at full throttle and RPM. My original supercharger came with the TRD FMU (Fuel Management Unit) that increases fuel pressure under boost, but mine seemed to be working backwards with fuel pressure going down under boost. I did some troubleshooting and found that my fuel pressure regulator was completely blocked off by some pieces of rubber that looked like slivers from the hose liner. My guess this came from the hose that came with the supercharger kit that is used to relocate the fuel pressure regulator so the FMU could be installed. I replaced the fuel pressure regulator and everything seemed to be working normally, well almost. Under full boost the FMU would jack the fuel pressure up from the normal 43 PSI to 65 PSI to force more fuel from the injectors. What I was seeing on my gauge was that the fuel pressure would go up to 65 PSI and then as RPMs went up the fuel pressure would slowly drop of to 50 PSI at max RPM. The gauge uncovered what I believed to be a serious problem, inadequate fuel volume from the fuel pump. You can see my fuel delivery page on how I corrected this serious shortcoming with the supercharger kit. The oil pressure gauge is really nice to have so you can see a problem coming and take corrective action before you loose your engine. The idiot light that is set to activate at around four PSI really is not much warning at all. I installed the voltage gauge simply to see how well the stock electrical system can keep up with the demands placed on it. It seems to handle the loads just fine, but I am not running a bunch of off-road lights, wench, or one of those bumpin-doof-doof stereos. Because of this I decided not to install a voltage gauge on my second truck. The water temp gauge was installed so I would have something with numbers on it that I could relate to unlike the stock gauge that is just kind of out there. I found that the cooling system is rock solid and once the engine reaches operating temperature there are absolutely no fluctuations on the gauge and the engine temperature is always maintained at the thermostat temperature set temp of 190 degrees F. It is so stable that I decided not to install it on my second truck. The oil temperature gauge showed me that the engine oil temperature stays within normal limits and is dependant on engine speed. The faster the engine runs under load the higher the oil temperature and that is completely normal. It is at its highest when cruising at highway speed. The 3.4 is equipped with an oil warmer/cooler that uses engine coolant to quickly bring the oil up to operating temp and then as the oil temp exceeds coolant temp starts to draw heat out of it. It appears that the stock oil warmer/cooler always keeps the oil temp at safe levels. Now that question was answered I did not see the need to install one on my other truck. I also do not see a need to install an auxiliary engine oil cooler even with the supercharger. The transmission fluid temperature gauge is very useful and showed that the transmission fluid temperate goes through very wide fluctuations depending on how the vehicle is being driven. During low speed operations like you would see off road or in stop and go traffic the ATF gets really hot because of the slipping action in the torque converter. I would imagine that driving in the sand would really superheat the fluid. The temp is at its lowest during high speed highway driving because the clutch in the torque converter is locked and it does not generate any heat. If you do drive off road, tow, spend a lot of time in stop and go traffic, or like driving on the beach you need to install an auxiliary transmission cooler and you would be wise to install a gauge. It seems that the stock over temp warning light is set very high. You can be running around with a superheated transmission and never know it and once that light trips I am sure your fluid does not have much life left in it. My second truck has a manual so I did not need a transmission temp gauge in it. The air/fuel ratio gauge interfaces with the stock oxygen sensor that is mounted in the exhaust stream in front of the catalytic converter. The oxygen sensor is coated with chemicals that react to the oxygen content of the exhaust stream and when hot enough will generate an electrical current in relation to the amount of oxygen in the exhaust stream. The ECU (Engine Control Unit) uses this information to determine the fuel mixture and make the appropriate adjustments to keep it in the correct range. The air/fuel ratio sensor taps into the signal wire going from the oxygen sensor to the ECU and uses a series of little LEDs to report that to you in a visual display so you can have some idea of what the mixture is. This feed back is EXTREMELY important when you install one of those aftermarket fuel computers like the Super AFC. If you try to install larger injectors and control them with an AFC you will need the air/fuel ratio gauge for feed back in you tuning. If you try to tune in an AFC or one other other similar gadgets without an air/fuel gauge and an EGT gauge you are simply nuts. You can destroy your engine in short order. Starting in 99 Toyota started replacing the front oxygen sensor with the new style air/fuel ratio sensor that is not compatible with aftermarket air/fuel ratio gauges. It was mostly the CA trucks in 99, but there seemed to be some all over the US, then more in 2000 and all in 2001. If you have one of these trucks you will have to install a standard oxygen sensor just to run the gauge. This will be in addition to the air/fuel ratio sensor that the ECU will need. You can get a good exhaust shop to bore a hole in the exhaust system and weld on a bung that will accept the oxygen sensor. I already had the TRD Boost Gauge installed and wanted the rest of my gauges to match it. I contacted Auto Meter, the makers of the TRD boost gauge and was told that their Z-Series gauges match the TRD gauge. I ordered a full set of the Z-Series gauges. I decided to go with the more expensive electronic fuel pressure gauge that has a center mounted needle and a full sweep scale around the face like the boost gauge. The electronic fuel pressure gauge is extremely accurate with a two-PSI resolution. It is a very nice gauge. The rest of them were the more traditional partial sweep gauges which is all Auto Meter was offering at that time in electric gauges. After getting my second truck I decided I wanted all of my gauges to match and I wanted them all to be Auto Meter with a center mounted needle and a full sweep face. Auto Meter makes a very nice powered EGT gauge, expensive, but very nice. That is the one I chose this time. I got another electronic fuel pressure gauge, but Auto Meter does not make an electric oil pressure gauge with a full sweep. I was a tad frustrated that I could not get an electric oil pressure gauge that would match my other gauges. I also did not want a mechanical gauge that required running pressure lines into the cab. I got a second electronic fuel pressure gauge and took it apart and relabeled it an oil pressure gauge. I don�t know why Auto Meter can�t do that simple thing. Now I have all matching gauges for once. 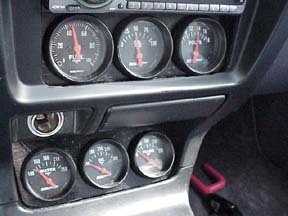 On my first truck I had nine gauges to install and no room to mount them. 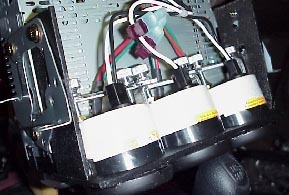 The plan was to install three below the radio and three below the ashtray in that area that looks like a storage shelf, but is not good for anything at all, and the last three in the double pillar pod. Installing the gauges is a major undertaking. The area under the radio is not to bad until I found that the gauges were hard to read from the driver�s seat do to the viewing angle. I had to tilt the mounting plate back a bit so that the viewing angle could be improved. The backside of the gauge mount that I installed below the ash tray. I made it out of an old road sign. The area under the ashtray was much more involved. 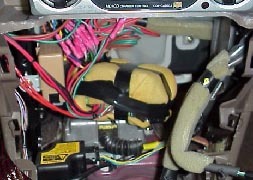 It involved major trimming of the dash face and moving some of the components mounted behind the dash. I will never do it again myself. I decided to do it a bit different on my second truck. I removed the combination factory radio with the in dash CD changer that took up both DIN slots and replaced it with a single DIN Sony. I installed the new radio in the lower DIN slot and mounted the gauges in the top one. I again ran into the same problem with viewing angle. Looking through the Auto Meter catalog I saw some things called angle rings. 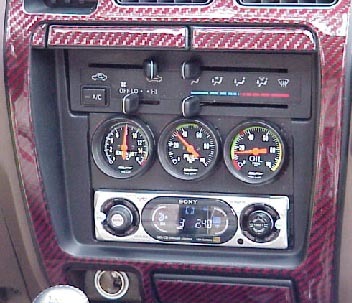 They mount between the gauges and the dash face and tilt them on an angle. The problem was they were too thick cross wise and there was not enough room to spread them out so I had to come up with another idea. I made my own angle rings out of some thin walled PVC pipe. It worked out great. This is the gauge mount that I installed in my 97 4Runner. It is mounted to the radio rack. 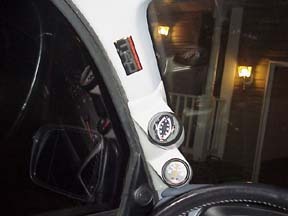 Another place to mount the gauges is in a pod that mounts to the �A� pillar trim piece. The TRD boost gauge comes with a pod that is attached to the �A� pillar trim. It only comes in black and if you want it to match you need to get creative with paint mixing. The way it mounts is that you install the gauge, pressure line, and bulb wires. Then you hold it up to the pillar and then drill a hole in each corner through the pod and the �A� pillar trim. Then you push a plastic tack like thing through the holes and that locks it into place, but the tacks are kind of tacky�. There was a quest for a pod that would hold two gauges, a double pod. There were none available at the time. I got a collection of double pods for other cars and found that the one made by Auto Meter Gauge Works was a fairly good, but not perfect fit. It is for the 94-98 Integra (part number 20111 gray). I had to heat the lower edge and flatten it out a bit and when it mounted to the pillar it did not mount flush on the windshield side. It also required the removal of the grab handle. The pod fit over the lower grab handle hole, but left the top one wide open. I covered it with on of the TRD stickers that came with my supercharger. Later on Ron Sherowsky decided to step up to the plate and have a custom dual pod pillar mount made specifically for the 4Runner/Tacoma. He found a company, Lo-Tek that would do a custom dual pillar mount for him if he funded the $600 fee to have the mold made. He did strike a deal with the company that if anyone orders the dual pod and mentions that Ron referred you, he would get a $10 rebate off each sale. If you order one please tell them Ron Sherowsky sent you. The Lo-Tek pod can be ordered painted to match your interior. To mount it you have to hold it over the stock pillar trim and then mark the top edge of the new pod on the trim piece. Then the trim piece is removed and cut just below this line and reinstalled. The new pod is then put in place and you have to drill holes into the �A� pillar for the mounting screws. I ordered one for my 96 4Runner. They did not have the matching gray paint at the time so I had to send them my whole �A� pillar trim piece to be color matched. Now they have 4Runner gray available. I installed the TRD boost gauge and a custom Westach gauge that has EGT/CDT (compressor discharge temp) in one gauge. Ever wanted to know how hot the air is leaving the supercharger? Once it was installed I found that there were a few things that I did not like about it. The angle of the pods seems to be a little off so from the driver�s position you can see a good part of the side of the pod where on the Auto Meter made pod it is the perfect angle. I think there is too much space between the pods and the top one is just to high. I would like the angle to be changed and the top pod mounted as close to the lower pod as possible to make it look a little cleaner. It does look much better then the Integra pod I had on there before. The funny thing is that Ron, the guy that fronted all the money to have the Lo-Tek dual pod developed, never installed it. He sold me his 4Runner before he got to install the pod. The dual pod was in a box in the back of the 4Runner when I picked it up. After careful consideration I decided not to install it and left the painted TRD pod in place and mounted three more gauges above the radio. I found a website called Quick-View that was marketing some vinyl stick on markings for gauges. I got some so I could mark the safe operating ranges on my gauges. The markings are intended to be mounted on the glass face of the gauges, but since I was already taking one apart I decided to place the markings right on the gauge face instead. It turned out really nice. stock low oil pressure warning light switch. All of these gauges only display information that is read from another location by sensors. The sensors are normally called senders and have to be mounted or installed differently depending on the type. The sensor for the EGT gauge is a probe that has to be placed into the exhaust gas. The probe has chemicals in it that react to heat and that causes a chemical reaction that produces electricity. The more heat the more electricity. On the Westach EGT gauge the electricity from the probe directly powers the needle in the gauge. This is simple, but there is a slight lag in the reading. The Auto Meter is a powered gauge that has an electronic control box that reads the current from the probe and amplifies it to power the gauge. They offer two types, one with an open tip that is very accurate and fast acting and of course more expensive. They also offer the standard Type K thermocoupler for a little less. Of course I went the more expensive route for the best accuracy. The control box needs to be mounted somewhere behind the dash. I mounted mine on top of the brake pedal support bracket. I wanted easy access to the control box for when I needed to replace my probe. They don�t last forever. 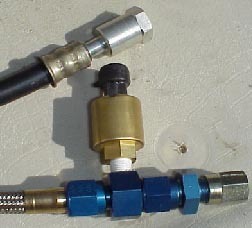 Different gauge manufacturers require the probe to be mounted at different distances from the exhaust ports, but generally they need to be mounted in a range of 4-8� from the port. 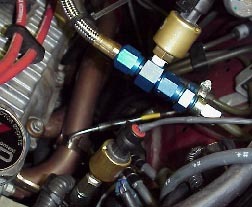 Most mount the probe in the collector of the exhaust header to get a composite reading of the group of cylinders. I did it that way on my first truck. On my second truck I properly mounted it about five inches from the port on cylinder number 1. The greater the distance from the port the lower the reading will be. Folks have always wondered how much of a difference it makes; well now I know. At idle is seems to be about 200 degrees F lower at the collector and at full throttle it is about 100 degrees lower. The boost gauge uses a long plastic tube that connects the gauge to the boost port on the supercharger. The oil pressure gauge uses a sender that screws into a port on the engine block that taps into the oil galley. The folks at Auto Meter got a little upset when I told them I was going to relabeled one of their electronic fuel pressure gauges as an oil pressure gauge. After the guy calmed down he did recommend that I remote mount the very sensitive pressure transducer so it would not be subject to the heat of the engine block, which is not a problem with the sender of the electric oil pressure gauge. I had a stainless steel braided Teflon hose made to remote mount the transducer. The regular oil pressure sensor on my first truck is mounted directly in a port on the engine block. Toyota was nice enough to leave several unused ports in the oil galley that are left plugged. I used a 3/8� NPT to 1/8� NPT bushing. I have been told that the ports on the engine are not NPT treads, but are British Standard Pipe Tread. In the big ports the 3/8� NPT bushing work fine, but the one where the stock low oil pressure warning sensor is mounted will need a BPT adaptor if you want to tap in there. NAPA has a kit for just that purpose to convert BPT to 1/8� NPT for your senders. It is part number 701-1550. 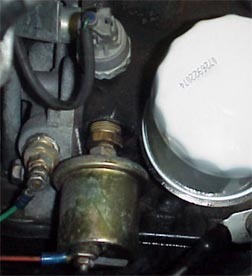 The oil temp sensor is installed using a bushing in the oil pump discharge port. There is a plug there that I removed and I used a 3/8� NPT to 1/8 NPT bushing. I used a large drill bit to cut away the metal of the busing on the backside so the sensor tip will have direct contact with the engine oil and read its temperature instead of the temp of the bushing. The water temperature gauge sender was mounted in an aluminum block and I tapped the heater hoses and ran that through the block and back to the engine. This was a temporary installation and was planning on drilling and tapping a hole in the manifold for the sender, but just never got around to it. 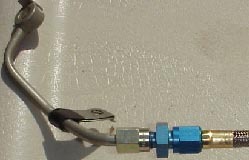 The transmission temperature gauge sender is again mounted in an aluminum block that is mounted in the transmission cooler hose going from the transmission to the cooler. The one leaving the transmission going to the cooler is the one that attaches to the steel hard line that connects to the transmission closest to the bell housing. The important thing here is that the sender will need to be grounded to the vehicle body and not the frame to complete the circuit. The frame is not grounded to the body of the vehicle. It took me a little while to figure that one out. The volt gauge is the simplest of them all to install. You simply tap the wire from the gauge to a wire that carries system voltage and the other to ground. Nothing fancy there. 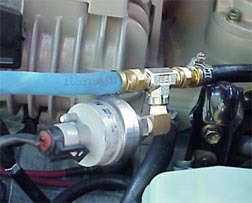 The electronic fuel pressure sender is called a pressure transducer and has four-wire cable that connects it to the control box that is mounted behind the dash. This transducer is a real pain to install. There is simply no easy way to do it. The transducer must be tapped into the fuel line between the fuel pump and the fuel pressure regulator. Toyota uses an unusual flare nut fitting where the soft line joins the hard line in the engine compartment. I could not find a way to duplicate this fitting so I could make a T fitting to plumb the transducer there. That left cutting the soft line and placing a T in it, but that results in a restriction to the flow of fuel that is something I wanted to avoid. The answer I came up with was to convert the fuel line over to something that I can get fittings for. I removed the supercharger so I could remove the fuel line from the engine. I then cut off the soft line and the flare nut off of the hard line on the fender and replaced it with a stainless steel braided Teflon line that uses compression fittings to attach the new line to the existing hard lines. The new hose has a fitting with an 1/8� NPT fitting for the transducer. It is not cheap, but works and is kind of sporty looking. oil pressure transducer and the EGT probe in the exhaust header. 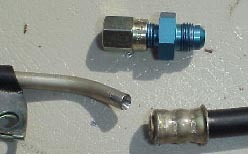 The hose assembly is made from Aeroquip fittings and hose. The fittings are AN style. AN stands for Army and Navy. They were developed a while back for the military so that hoses and fittings could be standardized in all military ships, vehicles, and aircraft. The fittings are self sealing and do not require any type of sealant during assembly. You will need to put Teflon tape on the pressure transducer when you install it in the NPT (National Pipe Thread). That is not an AN style fitting and does require sealant. Aeroquip is now owned by Eaton, the makers of the supercharger used in the TRD kit. Overall I really like using AN hoses and fittings whenever possible. It is very easy to work with.